Kaolin is a fine clay mineral used in ceramics and insulators. The Cherokee Nation was issued a patent in 1744 for the production of porcelain from a mixture of kaolin, quartz, and feldspar. In 1767 Thomas Griffiths had five tons of kaolin dug and transported to England from the Cowee section of modern Macon County for use by the Wedgwood potters in making fine medallions. 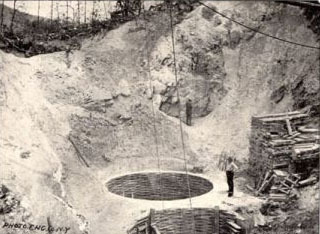 Systematic mining began in 1888 near Webster in Jackson County, and by 1900 North Carolina had become a significant producer with tonnage sent to Trenton, N.J. Kaolin has continued to be an important product of North Carolina mining. J. L. Bundy and P. A. Carpenter, Feldspar Resources of North Carolina, North Carolina Geological Survey Information Circular 20 (1969). J. C. Olson, Mica Deposits of the Franklin-Sylva District, North Carolina Geological Survey Bulletin no. 49 (1946). Kaolin Mine, Harris Clay Co., Near Webster. From Clay Deposits and Clay Industry in North Carolina, by Heinrich Ries, 1897. Available from http://www.wcu.edu/library/DigitalCollections/TravelWNC/1890s/1890dillsboro.html (accessed July 12, 2012). 1 January 2006 | Seaman, Jean H.